The winner will be announced during a high-profile ceremony to be held in the month of October. The SEOY India Award promotes social entrepreneurs in India by recognizing organizations that work to promote inclusive growth and contribute to bring change in the society through their entrepreneurial vision. The winner of SEOY India Award earns a chance to participate in the annual and regional meetings of the World Economic Forum (WEF). These meetings offer unprecedented opportunities to engage with global decision makers from the public, corporate, media, academic, and civil society sectors. 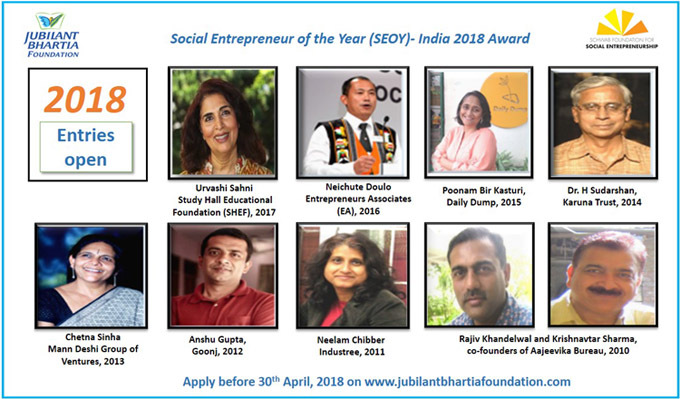 This year, SEOY ventures into its 9th successive edition, commemorating the partnership between Schwab Foundation for Social Entrepreneurship and Jubilant Bhartia Foundation, by building and sustaining an ecosystem to promote social entrepreneurship in India. Last year, Ms. Urvashi Sahni of Study Hall Educational Foundation, Lucknow was conferred this prestigious award for her exceptional contribution in the field of education, empowering and building leaders among India’s most disadvantaged girls. She was felicitated for her work by Shri Suresh Prabhakar Prabhu, Minister of Commerce & Industry, Government of India in the presence of over 300 distinguished guests at a high-level celebration in New Delhi. The SEOY India award celebrates and applauds social entrepreneurs and their ventures that implement innovative, practical and sustainable solutions to address poverty and the lack of basic services and resources in ‘Bottom of the Pyramid’ and ultra-poor communities, i.e., health, education, job creation, water, clean energy and access to information and technology. Social entrepreneurs develop a revenue stream through the sale of products, services, fees or develop key partnerships to stay sustainable. The Schwab Foundation for Social Entrepreneurship is a not-for-profit, independent and neutral organization, co-founded in 1998 by Prof. Klaus Schwab, Founder and Executive Chairman of the World Economic Forum, and his wife, Hilde. The Schwab Foundation for Social Entrepreneurship provides unparalleled platforms at the regional and global level to highlight and advance leading models of sustainable social innovation. It identifies a select community of social entrepreneurs and engages it in shaping global, regional and industry agendas that improve the state of the world in close collaboration with the other stakeholders of the World Economic Forum. World Economic Forum: Committed to improving the state of the world, is the International Organization for Public-Private Cooperation. The Forum engages the foremost political, business and other leaders of society to shape global, regional and industry agendas.